Lying off the southeastern tip of the Bahamas, the Turks and Caicos Islands encompass one of the world’s largest coral reef systems, earning the islands a reputation as a premier dive destination. Exquisite white-sand beaches fringe this necklace of about 40 islands, where water sports, nature trails, iguana reserves, underground caves, and dazzling seascapes are the main draws. Fishing is also excellent, and from January through April, you can spot humpback whales on their annual migration route around these unspoiled islands. The Turks and Caicos Islands are a British Overseas Territory, and only eight of the islands are inhabited. Cruise ships glide into the main port on Grand Turk, home to the quiet capital of Cockburn Town. Providenciales, known as “Provo,” is the most developed island, and its spectacular Grace Bay is one of the planet’s most ravishing beaches. Middle Caicos, the largest of the Turks and Caicos Islands, has the most dramatic coastline, with limestone cliffs plunging to turquoise bays. 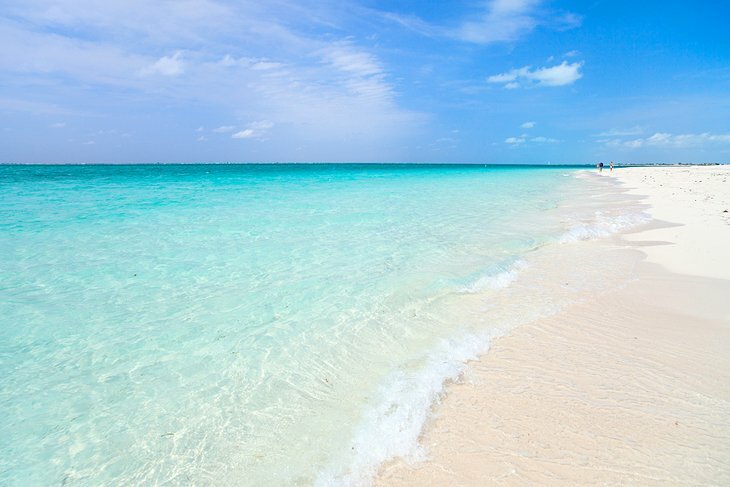 Stretching for more than eight kilometers, Grace Bay is one of the best beaches in the Caribbean. Powdery sand meets crystal-clear water in striking shades of blue along this exquisite slice of coast, and coral reefs shimmer just offshore. Part of the Princess Alexandra Marine Park, Grace Bay Beach is the focal point for tourism on the island of Providenciales. Snorkelers can view the rich marine life at The Bight Reef and Smith’s Reef in the underwater park, and you can easily access them both from shore. The bay is also the playground of “JoJo” the wild bottlenose dolphin, who interacts with humans and has been declared a national treasure.